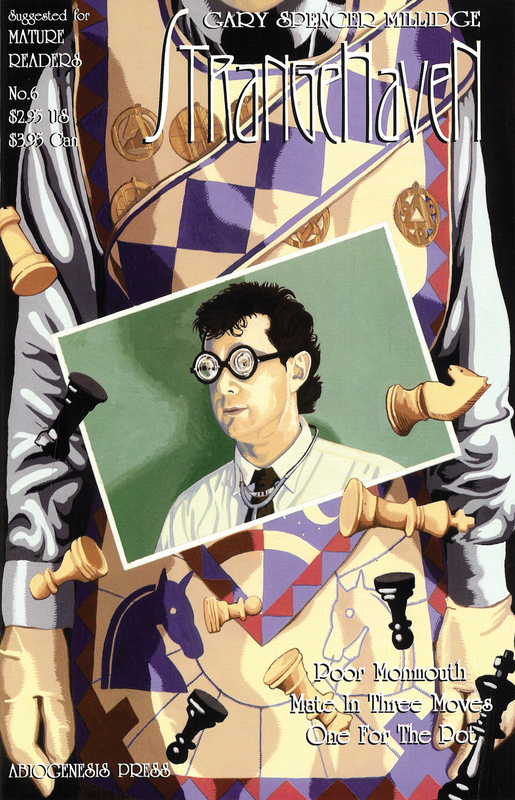 Long-time readers of Strangehaven in its periodical format may remember my cover to issue #6, which featured an inset of the good Doctor Houseman (given that name, incidentally, almost ten years before Hugh Laurie’s Doctor House hit our screens). The background section of the artwork consisted of a Knight of the Golden Light’s costume and some chess pieces hovering about in mid-air. The interior of the comic also featured the doctor and his brother playing chess, as well as incorporating a number of chessboard pattern motifs throughout, which is why it’s become part of a huge chess-themed comics exhibit at the World Chess Hall of Fame in Saint Louis, Missouri. Yes, comics can lead you down some unusual avenues. But chess is a frequent theme for many comics covers, and one that I have a penchant for collecting myself. In fact, the exhibition, POW! Capturing Superheroes, Chess & Comics! has assembled over 200 chess-related comic books, and has them all on display, along with comic character chess sets, and plenty of fun stuff for kids to enjoy. Among the gems on display are More Fun Comics #76 (1942), Action Comics #112 from 1947 featuring Superman in “The Cross-Country Chess Crimes” and original artwork by Bob Clarke from Mad Magazine #78 (1963). There’s short video that's worth a watch here: KSDK website. POW! Capturing Superheroes, Chess & Comics! is open seven days a week and admission is free. It runs until September 17, 2017.